Even if you don’t have full sun, you can still create valuable habitat for many beneficial animals in your landscape. Some plants that were listed in the Full Sun list can also be used in part shade too (one that bears repeating now that the Monarch numbers have been finally released is Swamp Milkweed (Asclepias incarnata), the Monarchs’ caterpillar food plant). All of the plants below support pollinators. Common names are listed first; latin names are in parantheses. 1. Sweet Joe Pye Weed (Eupatorium purpureum)a Joe Pye weed for shadier conditions. Gets tall, place in the back. 2. Sweet Brown-eyed Susans (Rudbeckia subtomentosa)Nice plant, tall for a rudbeckia; mulit-branching and covered by many small flowers in the later summer/fall. 3. Golden Alexander (Zizia aurea)early nectar source for smaller pollinators and food plant for Black Swallowtail butterfly. Can make a nice ground cover. 4.Anise hyssop (Agastache foeniculum)– another wonderful plant. Has so many things going for itwonderful little spires of purple flowers (used by smaller pollinators, skipper butterflies love these), smaller birds love the seeds, and Stephanie has observed a Summer Azure laying eggs on the flowersdid not see it listed as a host plant anywhere in the literature, so maybe the Azure was confused, or its an unrecognized host plant. Wonderful anise-like smell too from the leaves when crushed. 5.White Snakeroot (Ageratina altissima)A nice plant and should be appreciated though many people probably pull it as a weed since it can be a prolific self-seeder. The leaves are nicely shaped and colored, drought tolerantalso can grow in full sun and beautiful white flowers that light up shadier areas. 6.Blue Mistflower (Conoclinium coelestinum)Beautiful clouds of blue blooms in later season. Can also take full sun. Spreads prolificallyshare with friends if you dont want it spreading too much. Easy to keep in check. Pollinators appreciate will be happy in later summer and fall. 7.Zig Zag Goldenrod (Solidago flexicaulis)Another late season bloomer important for all pollinators, can tolerate range of sun conditions. Meadowhawk perched on Obedient Plant (towards the end of blooming); New-england Aster in the foreground. 8.Turtlehead (Chelone glabra)Another plant that can be found in a range of sun conditions. Hummingbirds appreciate them too. Host plant for the gorgeous Baltimore Checkerspot butterfly. 9. Obedient Plant (Physostegia virginiana)Beautiful plant-attractive foliage, and pink spires of flowers, remniscient of snapdragons. Pollinators attracted to this plant. Can be aggressive, but easy to keep in check. Also happy in full sun. Very adaptable. 3-4ft tall. 10. Native Geranium (Geranium maculatum)Another adaptable plant. Provides early nectar. Nice foliage as well as flowers. Low mounding. (The featured image at the top of the page beneath the menu is Drummond’s Aster, which can take any type of sun. 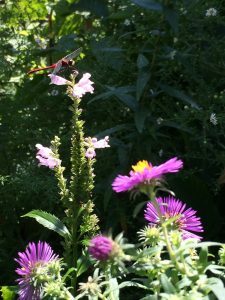 In lower sun conditions, may end up shorter with less blooms, but is a great pollinator plant, and the foliage of asters support a large range of insects, including the Pearl Crescent butterfly).